It is perfectly normal to not have a title when you are beginning, in the process or about to finish your book. As we said, sometimes titles come to you naturally and sometimes they are very elusive. If it’s the first case, then that’s very good for you; but if it’s the latter, there is no need to panic. There are writer’s who do not go on with writing just because they don’t have a title. They get stuck on this step and give up on the writing. It’s perfectly normal to not have a title when working on your manuscript. However, if you are the kind of person that gets bothered by not having a title, you can always choose to have a working title. Once you are done with your draft and have spent enough time choosing your title, you can come back and change it. Some authors actually end up using their working titles because they seem to think they fit the book very aptly. One of the most fundamental rules to naming your book is naming it in accordance to the book. First of all, you should be clear about what genre your book falls under and give it a title that suits that particular genre. You don’t want to name your romance novel The Murder of the Cat or your fantasy novel In Your Arms. Another important thing to do is to keep track of trends in the names of your particular genre. For example, one popular trend in fantasy novels is to use the preposition of; The Mirror of Charath, Mage of Ajath. The main reason for keeping these points in mind is to make sure you reach your target audience. An avid reader of romance is not going to be attracted by a tittle like The Mirror of Charath and hence you should be able to name your book in such a way that it can appeal to your readers. When you are trying to finalise your book title, it is a very good idea to search up the names on your list online. You do not want to give your book a similar title to that of another one, especially a famous one. When someone searches for your book, the first thing that appears should be your book and not another one. So imagine a scenario where your title in similar to a famous one like Hunger Games; obviously the book that is going to show up first is not going to be yours. This is not only in the case of books, but also movies. If your book title is Home Alone, then it’s not your book that is going to show up again. One effective way to title your book is to find keywords or phrases from your own book. These are usually words or phrases that are repeated often in the book, character names, their strengths, or something that stands out in the book. Such titles are usually the best choices as they are most suitable to your genre, are original and unique. They will have a very close and personal relationship to the book itself and are likely to be memorable. There is no reason to stress the importance of titles when it comes to the marketing of your book. You want someone to stop and notice your book. There are a few ways you can do this with your title. One is the ‘contrary to perception’ title where a very common idea is followed by something so different that it grabs our attention; for example, I’d Tell You I Love You, But Then I’d Have to Kill You. Another method is to use outright shocking titles like Would You Eat Your Dog. The last one would be to use familiar phrases or old poetry that people would easily recognise. Some examples would be The Devil Wears Prada, Of Mice and Men and A Thousand Splendid Suns. Make it easy to say : One of the easiest ways for a book to be popular is by word of mouth (as old as it sounds) and if your title is hard to pronounce, then not everyone is going to want to recommend it. Ask around for advice: It is important to ask people around you what they think about your list of potential titles. If you have beta readers, they would be a great help. You could also conduct polls and surveys on social media with your followers. 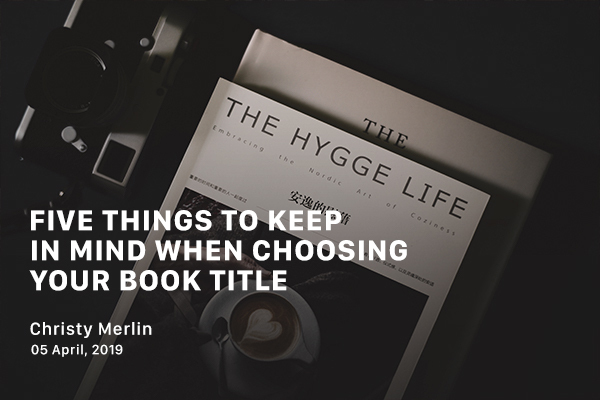 I hope these tips help you with finding an apt title for your book. If there are any other pointers that you believe would help with finding a good title, please do comment. Christy is a student, part-time writer, and a full-time Wannabe. She devours books and binges shows.